Last week it was brutally hot around here and all I could think about was the Mexican corn I had at the Eat Real Festival. See my post about the festival on EcoSalon. I had some corn in the fridge that needed eating so I went out shopping for more food and inspiration. 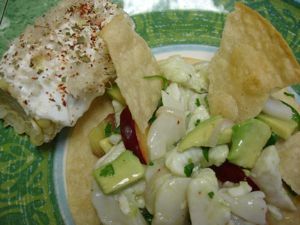 I walked into the fish store at Market Hall in Rockridge and I immediately thought, “Ceviché!” And there you have it: Mexican corn and ceviche on a hot night. Perfection. 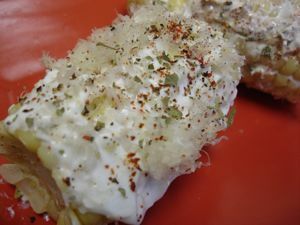 Slather with thick, plain, Greek yogurt (for all those people that are freaked out by mayonnaise) Sprinkle with Mexican oregano, Aleppo pepper, and Parmesan cheese. Combine all the ingredients and refrigerate for about 45 minutes before serving. Plums? you say? I don’t know where the plum idea came from. It just popped into my head. Too much Top Chef? Anyway, it worked, playing the same role as tomato would in ceviché. I freshly fried corn tortillas before serving and I’m telling you it was good. I have no idea why I don’t make ceviché more often. For the Aleppo pepper in both recipes, you could substitute cayenne (be careful because it’s usually hotter) or some other mild, ground chile. I just really love Aleppo for its heat level and slight fruitiness. 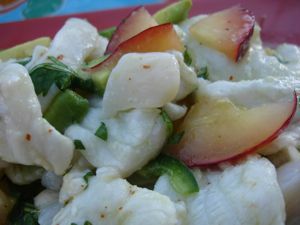 This entry was posted in Latin American, from the market, fruit, healthy, seafood. Bookmark the permalink. Post a comment or leave a trackback: Trackback URL.